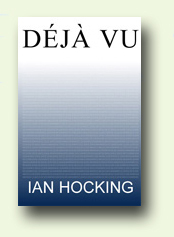 Listen to Ian Hocking's freely downloadable debut novel, Déjà Vu, an acclaimed technothriller with a science fiction edge. First published by the UKA Press (http://www.ukapress.com) in January 2005. Photo copyright (c) Mimika Cooney 2004. I'm a 29-year-old British writer who recently published his first book to critical acclaim. Which was nice. As well as being a writer, I'm an Associate Lecturer in psychological research methods at the Open University, and I'm Psychology Section Editor for the UK's Social Science Information Gateway (SOSIG). Say howdy via ian_hocking (at) uk2.net, particularly if you’re a literary agent. Read the first chapter (PDF). All reviews of Déjà Vu. My writing encompasses genre and non-genre fiction from the future to the present day, and sometimes the past. I'm interested in the impact of determinism and technology on individuals and society. And ice-cream. As well as being a writer, I work as an Associate Lecturer at the Open University, and I'm Psychology Section Editor for the UK's Social Science Information Gateway (SOSIG). 'Mardi Gras', read by the author. Published in Citizen32.